Christmas parties are currently in full swing and NYE is just around the corner. For any of you who aren’t super organised and are still looking for an outfit you might want something different to a sparkly, sequinned, velvet or lurex dress? Sometimes it’s nice to go for something a bit more out of your comfort zone which has got that ‘wow’ factor. So I hope I’m not too late to the party with this post, but I wanted to show you guys two outfits from Nasty Gal which are perfect alternatives to your standard party season outfit! Before we get into things I’m just going to give myself a pat on the back and to any other Fashion Bloggers out there who are currently shooting outfit pics outside, it is SO SO cold at the moment! Especially when you’re basically not fully dressed, someone pass me my coat! Also funny story (I didn’t think it was funny at the time…and still don’t now to be honest but hey I’ll let you have a laugh at my expense! ), whilst shooting the last outfit you’ll see in this post, as we were pretty much wrapping up and ready to get back into the warmth, my boyfriends flat mate left to go out to the shop. Now this would’ve been fine, if Jake had his keys, but no…he didn’t, and with his flat mate Rich being sensible and locking up the house, it meant we were well and truly locked out. To top things off, as we were shooting nearby his house neither of us bothered to take our phones with us either so couldn’t ring him and had to wait it out. Absolute Nightmare. So it basically meant we had to stand outside in the cold, with me wearing a blue mermaid satin two piece suit and heels, for about 30-45 minutes. Jake was nice enough to offer me up his spare hoody and his coat (he was wearing a jumper underneath don’t worry I’m not that cruel.) So for your own amusement picture a very very cold me, wearing the below outfit, with a cream hoody and a Barbour jacket over the top…not exactly glamourous. Safe to say, I wasn’t a happy bunny. Sorry I’ve rambled enough haven’t I? Now onto the outfits! 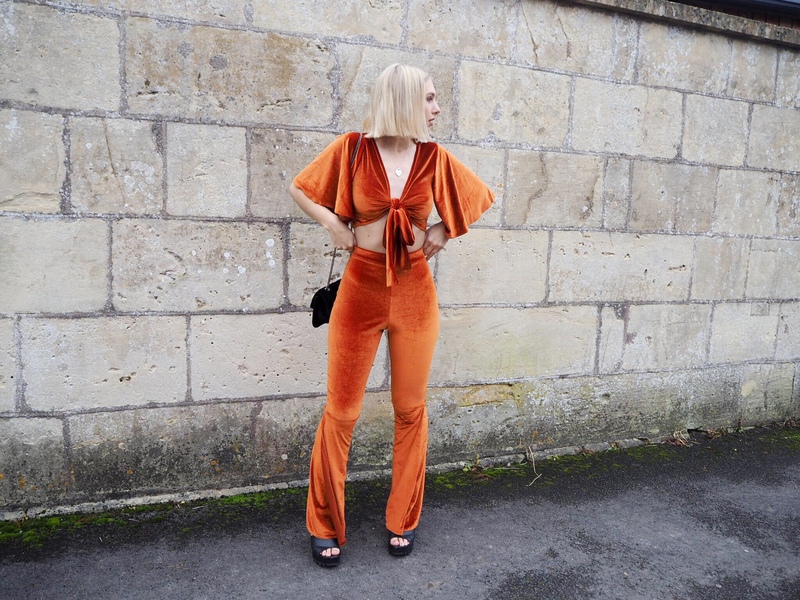 First up is this uh-mazing orange velvet two piece. This is something that is slightly out of my comfort zone but when I saw it I just loved the colour as it really stands out and I feel like it goes well with my new lighter blonde hair! I also really like the fact that the trousers are flared and the sleeves are really floaty (I’m sure there’s a technical term so someone please correct me) which made me feel so sassy wearing this outfit! I think this would make the perfect Christmas party, general festive night out or NYE outfit and is something a bit different and daring to the usual black velvet dress option I would normally sway towards as a safer bet. You shop this outfit on the Nasty Gal website here. FYI for anyone thinking of ordering this, I’d go down a size. I actually had to re order in the size below as the original size that I’d normally go for was way too big. Secondly is the blue satin two piece blazer and flared trouser set. I’ve wanted a suit for ages but just hadn’t found the right one yet. I was searching everywhere for one that I liked and came across this one on Nasty Gal. Again, this is possibly a bit more out there then I would usually go for, but I love it so why not and I think it would be perfect for any festive nights out you have planned! As my friend Libby said, it definitely has that 90’s Spice Girls vibe to it, which I am totally okay with. I also decided to pair it with my Calvin Klein bra, which has fast turned into my favourite bra ever. I thought this added a bit of edge to the outfit and kept it a bit more casual than if I’d of opted for a pretty lace bra. You can find this on the UO website. However, if you want it all to be a bit more matchy matchy then they do offer a matching bralet as well, see here. You can also shop the blazer here and the trousers here. In total this outfit might seem pretty expensive for some, but not to worry, i’m always seeing Nasty Gal offering really good discount codes at the moment so just have a look out for them! I think I got 30% off this order. Also, just to clear up, I am definitely aware that this needed a good iron but Jake doesn’t actually own an Iron (I know right, they only cost about £15! ), so I had to just make do! Hopefully the creases don’t offend anyone too much! And that’s it! I hope you’ve enjoyed and maybe gained some confidence to go for a brighter bolder outfit choice this Christmas! I love this! My favourites the blue one. I really need to decide what party wear I’m going to get. Thanks so much hun! Definitely check out Nasty Gal they’ve got some great party wear! Thanks girl! same I love the touch of Calvin just adds a bit more of a casual edge to the outfit! I love these outfits! I feel like they’re so perfect for New Years!